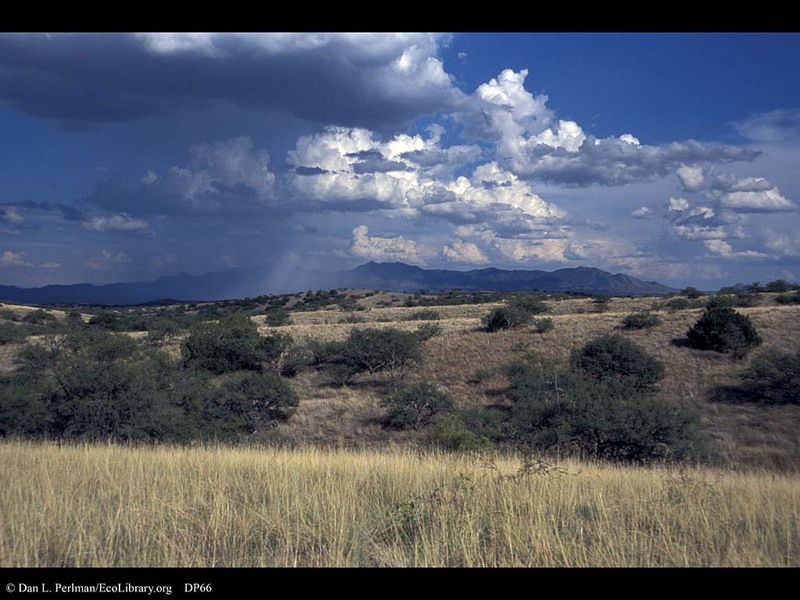 Rainfall in dry grasslands, Arizona. Rain in the desert and the dry grasslands seen in this image is very irregular in time and space. Months may pass with little or no rain, followed by light or heavy precipitation. Here one can see just how spotty rain can be geographically. The foreground is in sun, as are the middle distance, and some of the Whetstone Mountains in the distance. But on the left side of the image, a rain shower is soaking a small portion of the landscape. A difference of just a few hundred yards or meters may lead to a dramatically different rainfall amounts. The Whetstone Mountains are one of the well-known Sky Island mountain ranges of Southeastern Arizona. Several such ranges rise up from the low and flat landscape. The cooler, wetter habitats in the mountains are isolated from similar habitats in other ranges that are separated by hot, dry desert and dry grassland. This type of isolation had led to speciation across the landscape.